The Faction, a street artist group, lined the Hollywood Walk of Fame with vinyl replicas of President Trump's star. HOLLYWOOD HILLS—Dozens of replica Donald Trump stars lined the Hollywood Walk of Fame on Thursday, August 9. A video of the crew who was involved in making the fake stars was posted on Twitter by The Faction. He tweeted, “Keep taking down the @realdonaldtrump star, and we will further spread Trump Derangement Syndrome by installing a never ending stream of stars.” The video shows men in orange construction vests placing the stars on the famous sidewalk. According to the Hollywood Reporter, The Faction and his crew spent almost $1,000 on the stars. The stars were later removed by the Hollywood Walk of Fame cleaning crew. The Faction continued promoting their work on Twitter posting pictures and asking people who enjoyed the installment of the stars to donate to his PayPal account in order to help his cause. Last week, Austin Clay, the suspect who destroyed Trump’s star with a pickaxe was charged with one count of felony vandalism. After damaging Trump’s star on July 25, Clay turned himself into the Beverly Hills Police Department and could face a maximum sentence of 3 years in state prison. The city of West Hollywood has proposed removal of Trump’s star. The city of West Hollywood has no jurisdiction over the Hollywood Walk of Fame. 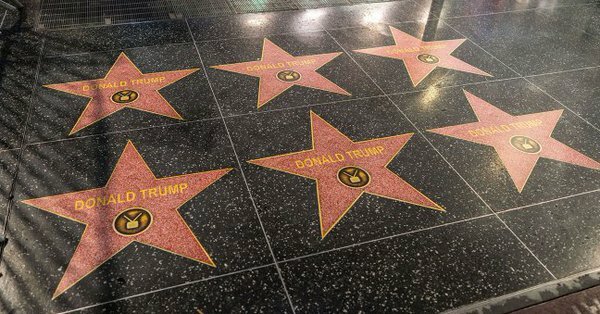 The Hollywood Chamber of Commerce is the organization that determines decisions regarding the display of the starred-tiles.